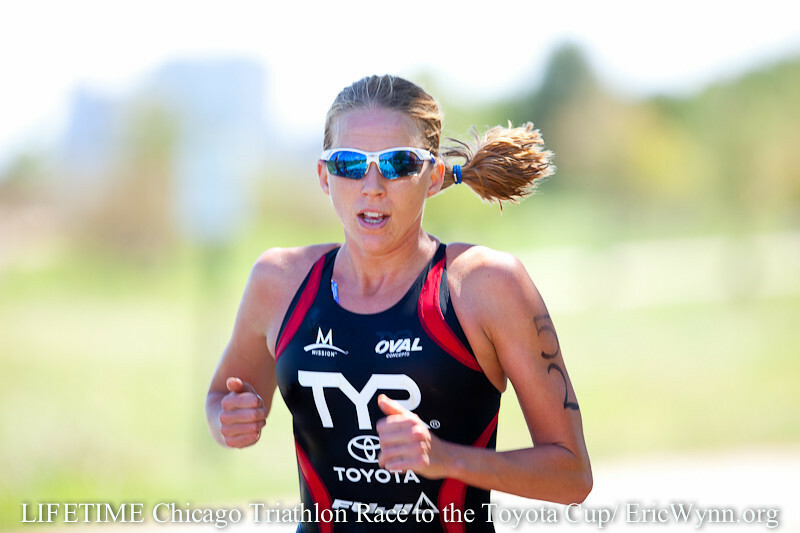 This past Sunday I competed in my third Chicago Triathlon and finished with my third win! I set a goal, raced hard and happy to cross the tape first. More importantly, I am focused on winning my second Race to the Toyota Cup Series in October. Chicago was my fourth win in the series this year, and I have one race remaining in Dallas. Chicago is a great city to visit and to race! Race logistics are easy; pre-race training along the paved running trails, and race start is just a couple blocks from the hotel. With Chicago being so close to my hometown; I always have lots of family members coming to cheer me on. This year was extra special, as not only did I have family members to cheer me on, but I had family members racing. My Dad finished 4th in his age group in the Super Sprint division, my cousin competed in the Kid’s Triathlon and my brother finished 23rd in his first ever Olympic distance Tri (in his first season). It has been a blast coaching my family and getting to see them compete and fall in love with the sport I am so passionate about! Chicago is a unique venue for the Pros, in that we start after all the age group waves, instead of going off first (which is normal). This allows the age groupers to watch us finish up and it was great to have so many spectators cheering us on during the start and finish of the run. The weather was absolutely gorgeous on race day; as long as you didn’t mind a little NW wind! My race nutrition: I had a little later breakfast than usual, my normal natural peanut butter/banana/honey/bagel with First Endurance EFS drink. Since the race started a little later in the morning, I had two gels before the race start (one 40 min prior and one 10 min prior). I also tried two First Endurance Pre Race tablets 30 min prior to the start. During the bike I drank 36 oz of EFS. Twenty plus pro women were on the deep water starting line which made for a pretty good size field for the race. The wind made the swim very choppy with a 400 meter swim down the Lake Michigan boat harbor and a 1200 meter swim back to the exit. The first 400 meters were with the tailwind, which meant the next 1200 meters were straight into a choppy, grueling headwind. The swim times were not exactly speedy, but I was feeling good and strong on the swim despite the conditions. 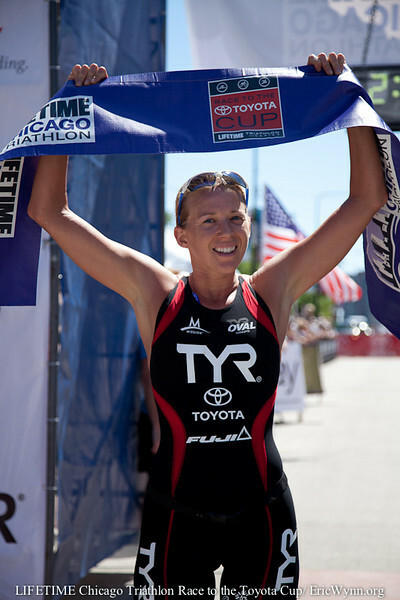 I swam with Sara McLarty during the length of the swim and exited the swim steps in second position. Due to the ½ mile run to the transition area, I decided to put on running flats so avoid the pain of running on chip seal barefoot! Once out on the bike the first thought that crossed my mind was, WIND. We had a strong headwind going on the slight uphill north. I could see several men in front of me and kept them in sight during the first segment of the bike. After the turnaround, the men gained time on me on the slight downhill section of the race, but I focused on keeping a steady rhythm and focused on keeping my eyes on the road to avoid cracks, etc. I recently changed my position on the bike and also switched to shorter crank arms, so I was excited to see how I would feel with my slightly altered set up (like it!) Thanks Rotor for supplying me with the new cranks. At the half-way point on the bike, I noticed Alicia Kaye and Sara McLarty were close behind me, (20 seconds), I pushed the bike a little harder the second lap and opened up a 45 second gap heading into the transition. ` The first ½ mile of the run, my quads felt the challenging ride. As I got going, my legs started to feel good and I focused on a keeping a high cadence the first 3 ½ miles of the run. The first part of the run was relatively “easy”, since we had a slight downhill with a tailwind the first 3.5 miles. I knew that last 2.5 miles of the race were going to be tough (slight uphill and headwind…not to mention fatigue as we are nearing the end of the race!). Once I made the turn, it was tough, but I felt good and just couldn’t wait to get to the finish line. I knew that I had a gap, but stayed focused since you never know what can happen until you get to that line! Post race, I got in my First Endurace Ultragen recovery drink, enjoyed time with friends and family and headed back home. 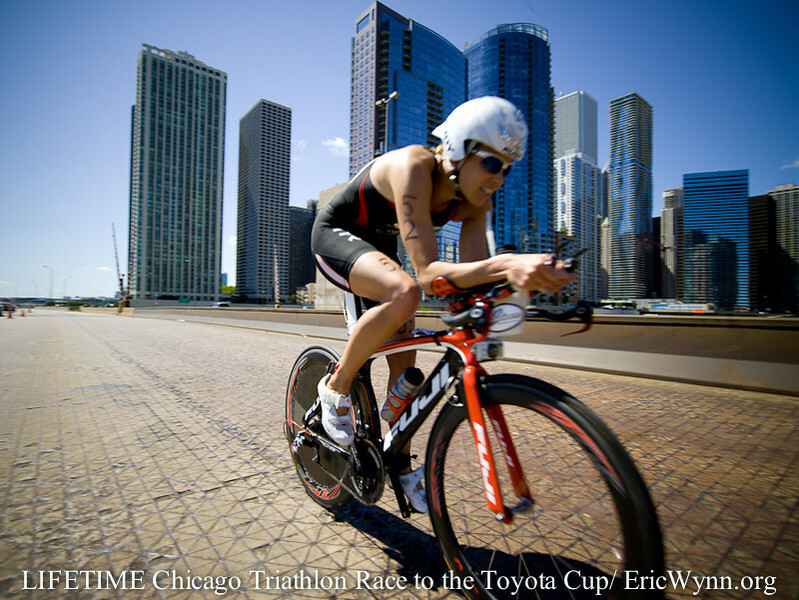 I have just a few more days until I head to Iowa for the Hy-Vee Triathlon! I am excited to race such a strong field of competition! It will be a challenge, but I embrace it. Also Thanks to Eric Wynn for the great Photos! !